This feature allows you to set up an order as a recurring order. Based on the information entered for the recurring order, it will generate a sales order at the prescribed time interval. This can be very helpful if you have a periodically recurring order such as a support contract that you have to bill your customer on a monthly basis. 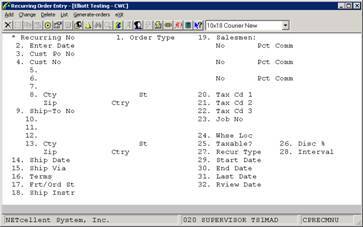 When the user chooses "Recurring Order Processing" from COPà Processing, the screen will appear to be similar to the standard order header screen. The user can add, change, delete and list recurring orders, as well as generate orders from recurring orders. 1 alphanumeric character (D or M). Enter “D” to specify the recurring interval to be in days. Enter “M” if you want the interval to be in months. Enter the interval for the recurring order. This can be a number from 1 to 999. Enter the starting date you want this recurring order to begin generating orders. This can also be helpful from a historical standpoint. Enter the date you would like this recurring order to stop generating orders. If the interval established in fields 27 and 28 would generate an order dated beyond the end date, then the order will not be generated. This is the date of the order last generated by this recurring order. Enter the date you wish this recurring order to be reviewed. This can be helpful if a support contract is to expire that the recurring order is based on. 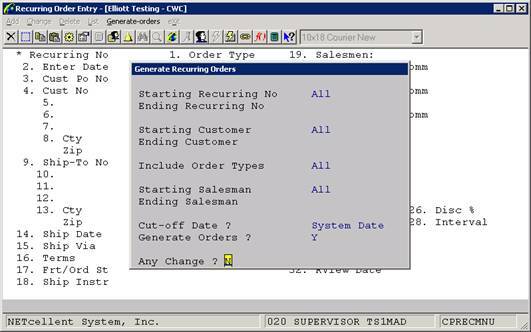 You can select the starting and ending recurring order number, the starting and ending customer number, which order types to include, the starting and ending salesman, the cut-off date and whether or not you want the process to generate the orders or just produce a report showing what the generated orders would contain. (1) Multi-Bin Enhancement: Not allowed for “I” or “C” type of recurring order. (2) Serial/Lot Enhancement: Serial/Lot Item is not allowed for “I” or “C” type of recurring order. However, non-Serial/Lot Item is still allowed for “I” or “C” type of recurring order. (3) No Credit Limit checking for recurring order, as well as line by line credit check. (4) Kit or Feature Item is not supported in Recurring Order Processing. a. Allocates quantity for stocked item (either in item file or inventory location file). If this item is BOMP parent item, the component item will be allocated as well. b. Updates Available to Promise (IMATPFIL). c. Updates Line Audit Trail File (CPLINAUD). d. Updates PO Reference File (CPPOREF). e. Updates PO Pending File (CPPOPEND). PO will not be created for recurring generation. f. Checks Credit Hold, Exceed Credit Limit & Past Due. It will put the order on hold if there are any credit problems. g. Copies the 5 Amigos from the Recurring Order to the regular Order.